Please call owner Dixon at 207-846-3332 or 207-653-8902. After years of extensive deepwater sailing, I was looking for a performance sloop and discovered a Clearwater 36 fin-keel. 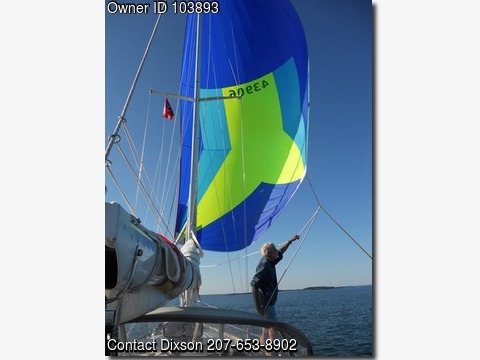 This boat is a modification of the better-known Clearwater 35 it is longer with a taller rig and a fixed fin-keel and is perfect for coastal ME. You must sail her to fully appreciate. Sadly, it's time for us to downsize once again. Good condition, fully equipped with many upgrades. In a pinch, she can sleep 7 and is quite spacious for a cruising couple. V-berth in the bow with head/shower to port, storage to starboard. Aft of the keel-stepped mast is a spacious salon headroom 6'3" with foldout table, cozy pilot and 2 settee berths, bookcases and cupboards. Galley with U-counter includes sink, stove, and icebox. Large quarter-berth starboard of companionway, good in rough seas.